Jason was the name of Amy Johnson’s Gipsy Moth. 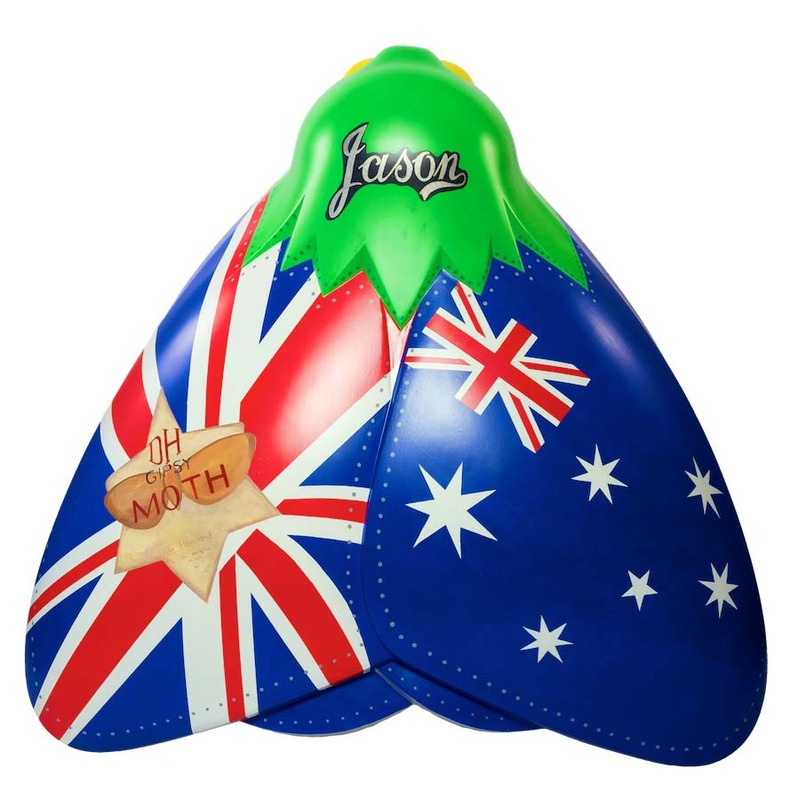 This design celebrates the starting and finishing point of Amy’s flight from England to Australia with both nations’ flags adorning its wings. Many of the real-life features of Amy’s Gipsy Moth can be seen in this design. A replication of the badge which appeared on the side of the aeroplane can be seen on the body, and the same shade of green which coated the plane decorates the moth’s head, which is finished with rivets for a patina. Detail on the under-carriage is adorned with the same lettering G-AAAH. Susan is a versatile West Country freelance artist and enjoys taking a variety of creative commissions. In 2015 she designed and painted a Shaun the Sheep ‘Another One Rides the Bus’ for Shaun in the City trail in Bristol, and designed and painted three Barons for Salisbury and Lincoln Barons trail and a Dragon for Taunton Deane. She has also worked on a collaborative project with Somerset Film for Somerset Carnivals, which include creating animations, designing costumes and taking part in the carnival processions. Previous commissions include designing and creating public artwork, including seven large 3D plaques for the Minehead Harbour wall in Somerset. Neill & Brown Global Logistics is an independent company which operates out of the Humber region and takes advantage of being located in one of the gateways to mainland Europe. The company was established in 1917 and has prided itself on offering logistics attracting worldwide clients since it began.